This Streamline Moderne building was built in 1948 by the Kullman Dining Car Company in Newark, New Jersey, for shipment to West Chester, Pennsylvania, where it operated as the Birmingham Grill until 1992 when it was purchased by the Carey Family for relocation to Truckee. On July 26, 1995 the diner arrived. 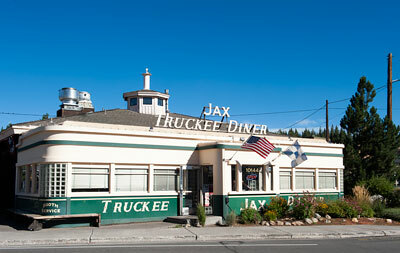 No other diner of its size and class had ever been trucked across the continent. After extensive restoration the diner opened on December 7, 1995. Source: Adapted from an interpretative marker in front of the diner. The Kullman Dining Car Company was established in Newark, New Jersey in 1927 and remained in business until 2011.